For show #9 this week – What’s more common than the common cold? (And do you have it, too?) Do you have symptoms? Does your neighbor? Odds are, at least one of you does (or will, before the year is out). More common than the common cold, more prevalent than hypertension, more frequent than any injury – stress and anxiety disable millions of Americans every single day. What will you do when no doctor’s around? You can learn to help yourself, and PhD candidate, Derek McKay, tells you where to begin. Armageddon Medicine with Doc Cindy teaches you how to be your own doctor when there’s no other choice. Drawing from decades of experience as a family physician, Dr. Koelker empowers you to care for your loved ones and yourself under adverse conditions of any sort. Learn life-saving skills and information to help you thrive should the lights go out for 30 hours, 30 days, or 30 years. In addition to her book, Armageddon Medicine and teaching Survival Medicine Workshops across the Country, she also serves as Medical Editor for SurvivalBlog.com. For more great shows, visit Preparedness Radio Network™. When you hate your job, yell at your kids, never feel rested, and the house is a wreck, is this just normal parenthood – or pathology? Today Doc Cindy discusses unhappiness and its cure with Jacquelyn (Jackie) Lee, MA, LPC, LLC, founder of Psalm One Counseling. Mrs. Lee specializes in treating stress management, depression, anxiety, anger, addictions, and hopelessness. Learn how to help yourself loved ones, should the need arise. 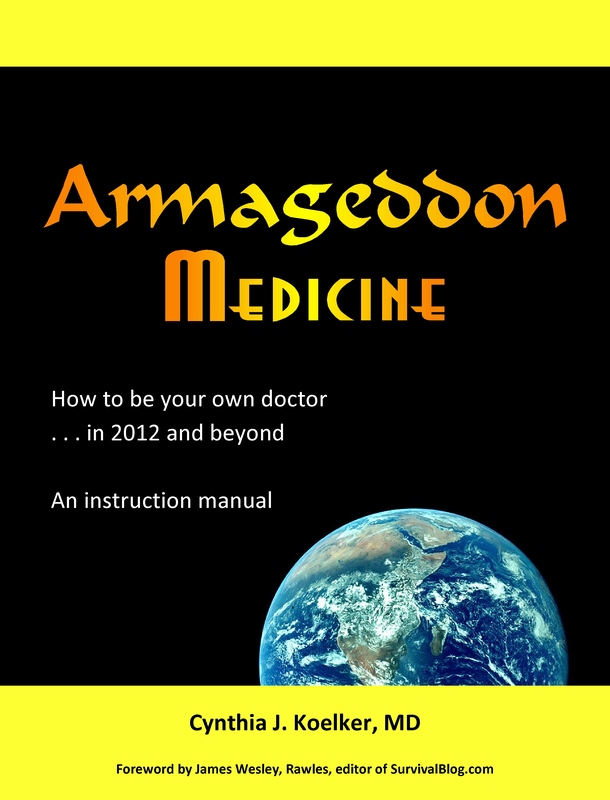 Armageddon Medicine with Doc Cindy teaches you how to be your own doctor when there’s no other choice. Drawing from decades of experience as a family physician, Dr. Koelker empowers you to care for your loved ones and yourself under adverse conditions of any sort. Learn life-saving skills and information to help you thrive should the lights go out for 30 hours, 30 days, or 30 years. In addition to her book, Armageddon Medicine and teaching Survival Medicine Workshops across the Country, she also serves as Medical Editor for SurvivalBlog.com. For more great shows, visit Preparedness Radio Network™. Mental Health and how to remain sane when everything falls apart. If you lose your house, your job, or your family could you go on? Would you even want to? Today Doc Cindy discusses mental health issues with Jacquelyn (Jackie) Lee, MA, LPC, LLC, founder of Psalm One Counseling. In times of stress, we all need ways of coping. Mrs. Lee specializes in treating stress management, depression, anxiety, anger, addictions, and hopelessness. Learn how to help yourself loved ones, should the need arise. Armageddon Medicine with Doc Cindy teaches you how to be your own doctor when there’s no other choice. Drawing from decades of experience as a family physician, Dr. Koelker empowers you to care for your loved ones and yourself under adverse conditions of any sort. Learn life-saving skills and information to help you thrive should the lights go out for 30 hours, 30 days, or 30 years. In addition to her book, Armageddon Medicine and teaching Survival Medicine Workshops across the Country, she also serves as Medical Editor for SurvivalBlog.com. For more great shows, visit Preparedness Radio Network™. AVOIDING STARVATION . . . HOW TO FIND FOOD WHEN THERE IS NONE If the pantry’s empty and the stores are closed will you succumb to starvation? Not if you know how to find food wherever you might be. Today Doc Cindy welcomes Tom Laskowski, founder and instructor at Midwest Native Skills Institute and SurvivalSchool.com. Tom is one of the top experts in outdoor and wilderness skills in North America. Armageddon Medicine with Doc Cindy teaches you how to be your own doctor when there’s no other choice. Drawing from decades of experience as a family physician, Dr. Koelker empowers you to care for your loved ones and yourself under adverse conditions of any sort. Learn life-saving skills and information to help you thrive should the lights go out for 30 hours, 30 days, or 30 years. In addition to her book, Armageddon Medicine and teaching Survival Medicine Workshops across the Country, she also serves as Medical Editor for SurvivalBlog.com. For more great shows, visit Preparedness Radio Network™. AVOIDING DEHYDRATION . . . HOW TO FIND WATER WHEN THERE IS NONE If the lights go out and the pumps go dry will you succumb to dehydration? Not if you know how to find water wherever you might be. Today Doc Cindy welcomes Tom Laskowski, founder and instructor at Midwest Native Skills Institute and SurvivalSchool.com. Tom is one of the top experts in outdoor and wilderness skills in North America. Armageddon Medicine with Doc Cindy teaches you how to be your own doctor when there’s no other choice. Drawing from decades of experience as a family physician, Dr. Koelker empowers you to care for your loved ones and yourself under adverse conditions of any sort. Learn life-saving skills and information to help you thrive should the lights go out for 30 hours, 30 days, or 30 years. In addition to her book, Armageddon Medicine and teaching Survival Medicine Workshops across the Country, she also serves as Medical Editor for SurvivalBlog.com. For more great shows, visit Preparedness Radio Network™. Doc Cindy answers listeners’ questions about Summertime Woes – problems you may encounter during the summer months, including bee stings, poison ivy, cat bites, sunburn, tic bites, and much more Drawing from her 30+ years experience as a Family Physician, Dr. Koelker teaches you how to be your own doctor when there’s no other choice. Learn life-saving information that will help you care for your loved ones and yourself should the lights go out for 30 hours, 30 days, or 30 years. In addition to teaching Survival Medicine Workshops across the Country, she also serves as Medical Editor for SurvivalBlog.com. For more great shows, visit Preparedness Radio Network™. Disaster in your home town – what’s it really like? How should you prepare? What might you forget? Listen as Doc Cindy interviews Eve Gonzales from Caring Hearts, Inc., a Christian disaster relief organization helping with disasters both at home and abroad. For more great shows, visit Preparedness Radio Network™. In this episode, Dr. Cindy answers common questions from readers. Are doctors afraid of herbal medicine? Can over-the-counter medicines be substituted for prescription drugs? What is her book Armageddon Medicine about? Want her to answer questions of your own? Send to them to: DocCindy(at)ArmageddonMedicine(dot)Net. Drawing from her 30+ years experience as a Family Physician, Dr. Koelker teaches you how to be your own doctor when there’s no other choice. Learn life-saving information that will help you care for your loved ones and yourself should the lights go out for 30 hours, 30 days, or 30 years. In addition to teaching Survival Medicine Workshops across the Country, she also serves as Medical Editor for SurvivalBlog.com. For more great shows, visit Preparedness Radio Network™. This entry was posted in Diseases, Education, Medications, Podcasts, Prescription Medications, Slide show, Symptoms. Bookmark the permalink.